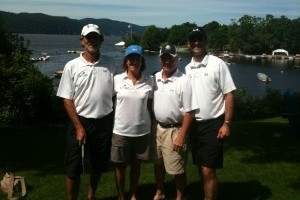 Mark Scribner, Mike Miceli, Kate Miceli, and Joel Desautels participating in the Special Olympics Board of Directors Golf Tournament held at Basin Harbor Club on July 12th. All proceeds went for fundraising efforts for the VT Special Olympics. Joel is a newly appointed member of the SOVT Board of Directors. Joel was also a part of the summer games as part of his role as one of the directors.